Police have confirmed that five people, including the gunman, were killed Friday in a series of incidents around the Santa Monica, California area. Two people killed in a related fire are said to be the assailant's relatives. Investigators said the gunman acted alone. Identified only as a white man in his late 20s, the suspect wore body armor and a helmet, and carried a semiautomatic rifle, shotgun and ammunition belt. He also wore a black sweatshirt that read “Life is a gamble” on the back. It was initially thought the gunman may have had an accomplice, and a second man described a “person of interest” was detained. The second man was later released, with police saying he is not suspect. The violence appears to have begun at approximately noon local time, when the gunman tried breaking into a home in the 2000 block of Yorkshire Avenue near Santa Monica College, according to the Los Angeles Times. Two people were found fatally shot in the home, which was then set on fire. The first two victims were the shooter's brother and father, police told the Associated Press. Police have revised the total number of victims to five down from a previously announced seven. He then moved west along Pico Boulevard, firing indiscriminately at cars, buses, and a police vehicle. Two pedestrians were killed at 19th Street and at least two more were hospitalized. Witnesses said the man then went to the corner and pointed what looked like a military weapon at three women in a car, ordering her to pull over. Jerry Cunningham Rathner, who lives nearby and saw what happened, told the Associated Press the shooter fired “three to four shots into the car” before aiming at other vehicles. As police surrounded the area the man made his way into the school library. Students hid with faculty in classrooms and turned off the lights. Stephen Bell, on campus preparing for a final exam, said two women ran into his class to warn him of the danger. Others said streaks of blood were visible on the library walls, where they heard several handgun shots followed by a volley of handgun fire. The shooter was then killed by police. US President Barack Obama was less than three miles away from the events attending a fundraiser. His motorcade route was redirected “to avoid any impact on the ongoing local response to the shooting in the area,” the White House press office said. Police do not think Obama’s presence in the area is related to the shooting, and he departed LAX airport at roughly 2:40 pm to meet with Chinese President Xi Jingping without incident. “The information we have indicates, at this point, that as many as half a dozen victims were shot and killed and several more were injured,” said Santa Monica Police Chief Jacqueline Seabrooks said during an afternoon press conference. Along with the two victims found in the burning home authorities said the gunman mortally wounded four people during the two-block walk to Santa Monica College. Two female victims were listed in critical and serious condition at Reagan hospital. Three others, also women, were in good condition at UCLA Medical Center. 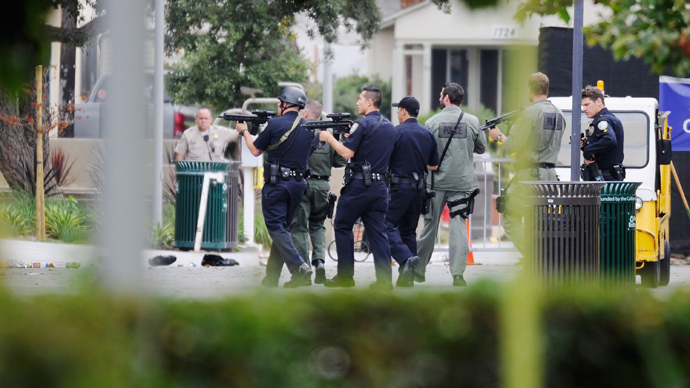 The gunman then ran onto the Santa Monica College campus, where exams were in session and students were graduating. The campus, nearby schools, and the surrounding area were placed on lockdown. A bomb squad was called in to investigate several bags thought to have been left behind by shooter.